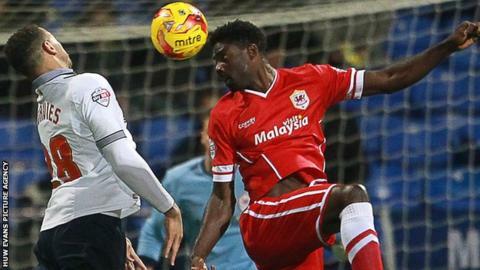 Cardiff City could be forced to play defender Bruno Ecuele Manga in Saturday's game with Derby County. Ecuele Manga has been in Equatorial Guinea on African Cup of Nations duty with Gabon since the turn of the year. Gabon have now been knocked out and he is due back in training on Friday. But Ecuele Manga, signed for £5m plus from French club L'Orient in September, may be called into action against Derby - second in the Championship - with fitness doubts over Ben Turner. Centre-back Turner limped off during last Saturday's 3-1 FA Cup defeat against Reading.